The charity auction organized by CSKA volleyball club as a part of the campaign “100 hearts for CSKA “ had enormous success in the ballroom of the Central Military Club. Objects donated by CSKA legends in various sports were sold at the auction. 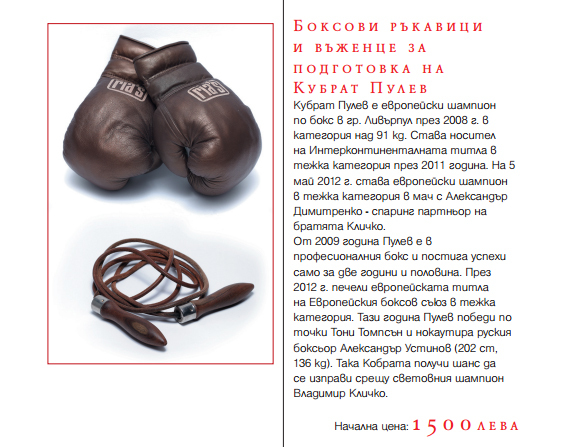 The highest bid was for the boxing gloves and the juming rope of the famous boxer Kubrat Pulev. Valentin Mihov won the bidding by paying 6,000 levs. The T-shirt of the CSKA captain Ivailo Stefanov from the times when he used to play for the national team was bought for 5,000 levs. 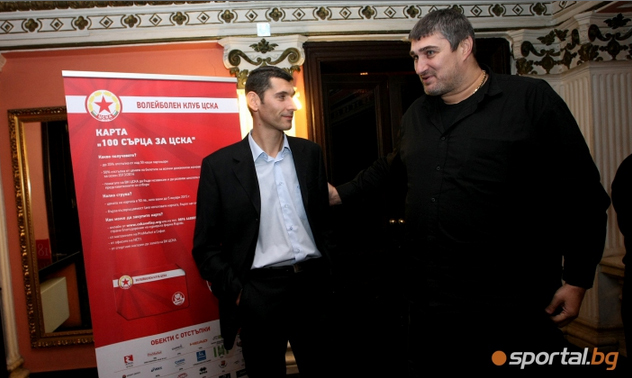 Among the other objects sold at the auction were the T-shirts of the volleyball players Antonina Zetova, Teodor Salparov, Matey Kaziyski, Plamen Konstantinov, the soccer player Dimitar Berbatov, the sports equipment of Stefka Kostadinova and Jordan Jovtchev, some personal belongings of Dimitar Karov and Michail Takov, the ball from the victory of CSKA vs Zenit (Kazan) in the Champions League, and the ice-axe of Doichin Boyanov with which he climbed Mount Everest and Mount Nanga Parbat. The attorney Radostin Vassilev bid for prize earned by the legendary football player and coach of CSKA Asparuh Nikodimov for his participation in the world championship in Germany in 1974. 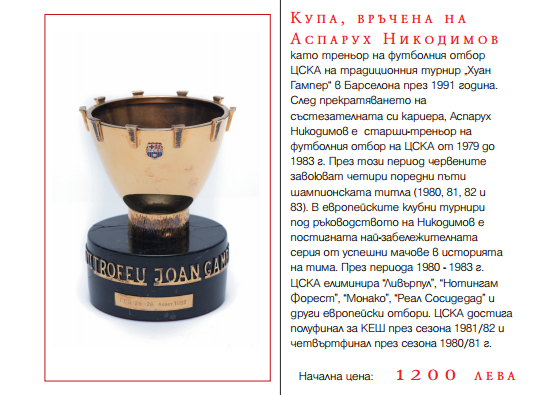 Another award donated by Paro, a cup from the traditional tournament in Barcelona “Joan Gamper” from 1991 was bought by the owner of www.Severozapazena.bg Todor Buzinski. 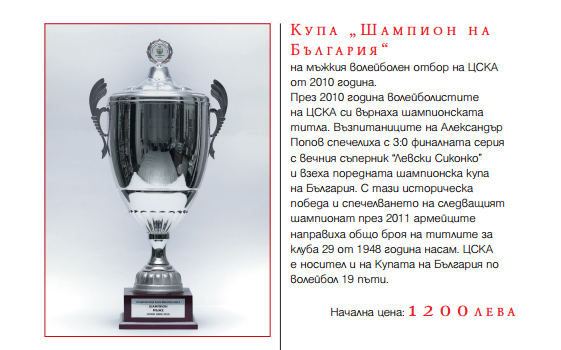 At the end of the evening, the football fans of CSKA from “Offensive” club made their bidding and won the “Bulgarian Champion Cup” earned by the men’s volleyball team in 2010. The precious award was handed by the executive director of CSKA Alexander Popov and by the former player Nikolai Ivanov. The culmination came minutes later when the fans announced they would donate the cup back to the club. “Let’s pay our respect to Alexander Popov and the rest of the CSKA volleyball club for what they have done”. The cup should be in the club, the members of “Offensive” club said. “That’s an exceptional gesture. At such moments we realize that everything we’ve fought for was worthwhile. And we’re given the courage to go on fighting. The love and support of all these people is invaluable. Now we see that with the campaign “100 hearts for CSKA” we have achieved our main goal – to be united in one big red family as in one community”, Popov said.A total of 47 700 euro is the amount collected for the repair of the sports halls used by the club, as well as to support the children’s sports school. Friends of Belogradchik and region beautiful nature will take a meeting in Sofia.